This episode opens with Sherlock questioning a prisoner in Minsk, and it’s a delightful scene because it’s more about the games with words and correcting the young prisoner’s grammar than anything else. Then we move from grammar humor straight to a scene out of the original canon: Sherlock is bored, and shooting a design into the wall at 221B Baker street with live rounds. 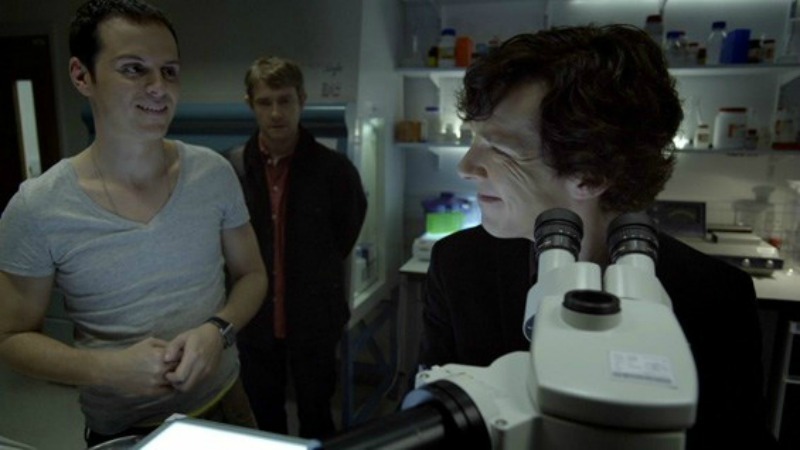 The dialogue between Sherlock and John is straight out of Doyle (mostly verbatim, actually), when John is astonished to find that Sherlock doesn’t know the Earth travels ‘round the Sun. We get this series’ version of the famous Attic Speech, wherein Holmes explains that his brain is an attic (in this updated case, it’s a “hard drive”) and he only stores essential information there that’s relevant to his work. 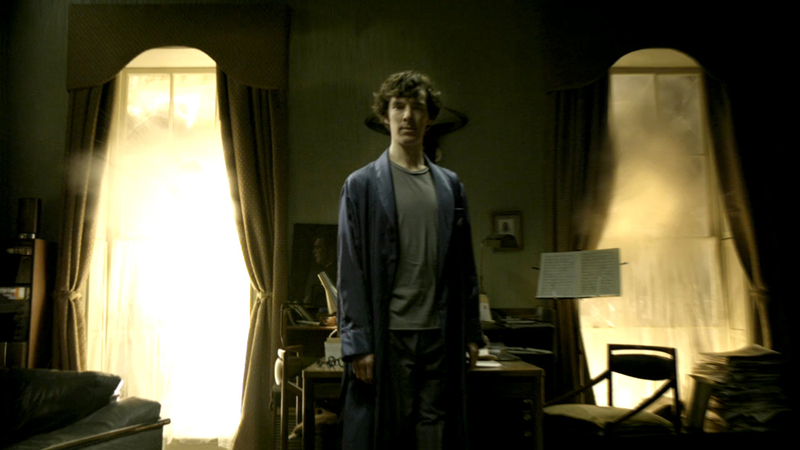 Sherlock’s complaints of boredom end abruptly, however, when the force from an explosion blows out the window behind him and knocks him down. This explosion means the Great Game is afoot. Each case is more tense than the one before, until we come to the Painting Is A Fake mystery, when Sherlock begs for more time, and the unbearably stressful sound of a little child’s voice echoes through the gallery with a mere ten second countdown. From Doyle: “All that I have to say has already crossed your mind,” said he. “Then possibly my answer has crossed yours,” I replied. 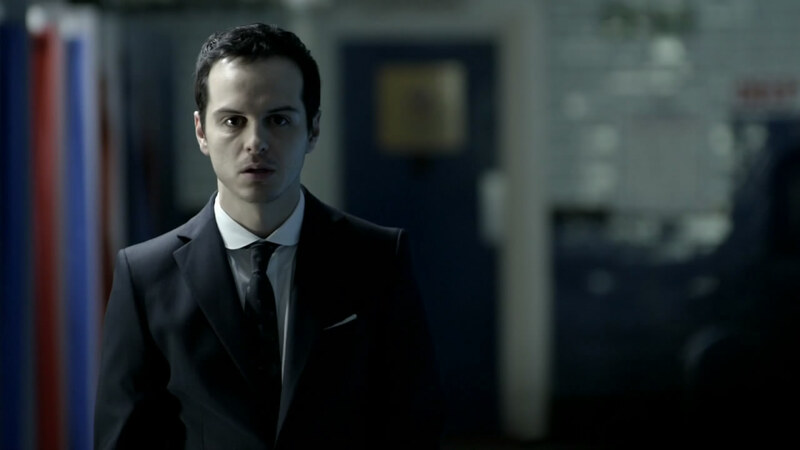 It’s also a fun note that apparently Scott didn’t know about the famous description of original Moriarty; that his “his face protrudes forward, and is forever slowly oscillating from side to side in a curiously reptilian fashion.” Mark Gatiss told him about it before the shoot, and what we enjoy in the scene is what Scott rolled with. Feel free to leave your own review of ‘The Great Game’ in the comments!